Once upon a time, the traffic on the Thames was the main artery of communication. Nowadays, there are only small scale passenger journeys and occasional cruises. London is passed by numerous channels, for example, the Regent’s Canal. These channels were used to transport goods, but today are used mainly for cruising boats. 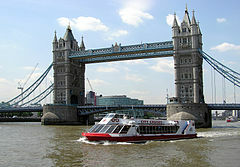 There are many types of cruises, some with a meal included in the ticket price, which you can buy from kiosks on the Thames. Of course, the cruise routes are more diversified, some beyond the city boundaries, but if you want to know more about London the best cruise is the classical one, that stops at the famous Tower Bridge. Whether you sit outside on the deck or under the shade of the large windows, the capital displays in front of your eyes with her small and major landmarks and minutes are flowing without even noticing. From Westminster Pier, which is next to Big Ben and the Houses of Parliament, to Tower Wharf, which is near the Tower of London and Tower Bridge, you have about 25-30 minutes to spend on the boat. With the same number of minutes at the return it is in total one successful hour cruise. For the journey to be complete, you can wait to leave from Westminster in the twilight, or take a break at the tower. The return will take place in the evening, so you can admire the colored lights on the water. 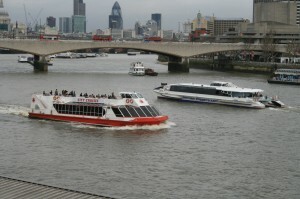 Thames Clipper is a water bus operating service on the River Thames and has a number of 12 luxury high speed boats. The high speed boats are luxurious to travel with even if you use the shuttle service in the daylight, during the night with friends or on a sightseeing trip with your family. Seating areas are comfortable, spacious and the climate is controlled. Moreover, all passengers have a guaranteed spot. When on board, you have WIFI network and the boats are equipped with facilities for disabled passengers. A wide selection of food is available throughout the day and many others specialties like coffee, tea and some breakfast meals (bacon, pastries and fresh fruit). This delicious food is the perfect accompaniment for a glass of wine, beer, champagne or different other drinks from the bar. FerryTO Travel Group can provide to a group an affordable coach ferry service and tickets are cheaper if you travel together. The same situation applies if you are part of a sports club, school or even just a large group of friends traveling together. If you have a group of cyclists and you need to get from one point to another you can use this service. The group travel ferry cycling can have different sizes, from a few friends to large groups of cyclists, including more than 150 persons. FerryTO groups can also organize transport for groups of cars and motorcycles from a smaller gathering of friends to big clubs. Finally, FerryTO groups offer coach and bus tour group bookings to hundreds of destinations across Europe..